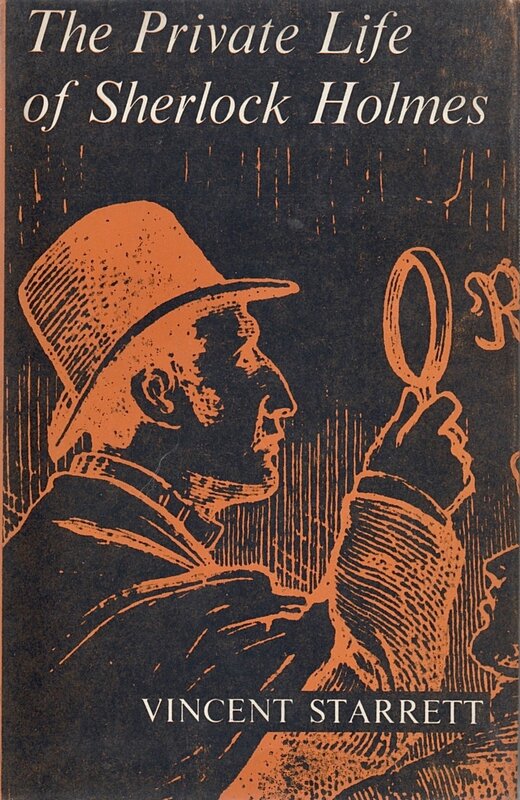 The dust jacket for The Private Life of Sherlock Holmes 1961 British edition. The horror of the X-ray effect is ameliorated just a bit by the use of orange. Lots and lots of Kool-Aid orange. The dust jacket copy for Allen & Unwin’s 1961 British edition. When Vincent Starrett’s book The Private Life of Sherlock Holmes was published in Britain in 1934, there were already a few other books of Holmes essays in circulation. The Holmes movement had been sparked by others in Sherlock’s homeland. Starrett was merely one more voice in the chorus. Much was the case with Starrett’s revised edition, published in 1961. As had happened with it’s older brother, this edition of Private LIfe appeared one year after it appeared in the United States. 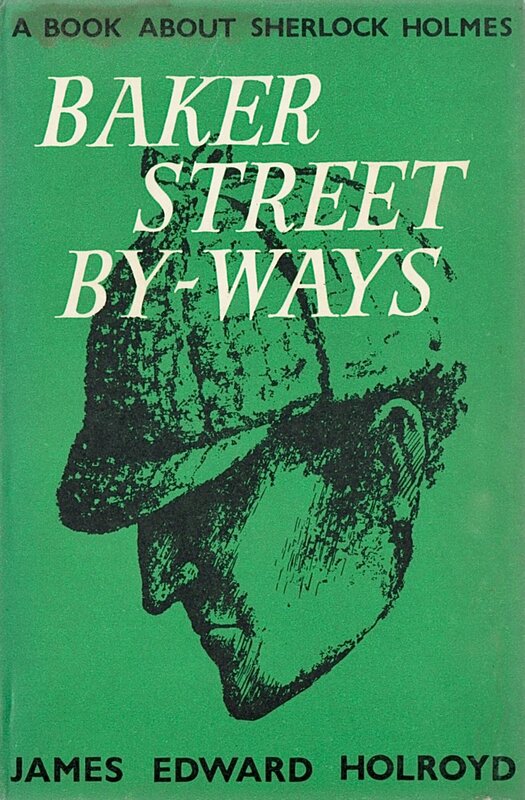 In the U.S. the University of Chicago Press published the updated edition, while the British edition had a more mainstream publisher who was already in the Holmes book biography business. Baker Street Byways (1959) by James Edward Holroyd. We will have a bit more to say about these two books later. George Allen & Unwin Ltd, London, 1961. Hardcover. Hardcover. 8 3/4" X 6". viii, 156pp, plus one page of advertisements which duplicates the content on the back of the dust jacket. Cover: Candy apple red cloth over boards. This is the first hardcover edition that had no illustration on the cover. Spine: The/Private/Life/of/Sher-/lock/Holmes/Starrett in white at head. Allen/and/Unwin in white at tail. Dust jacket spine: The/Private/Life/of/Sher-/lock/Holmes/Starrett in black at head. Allen/and/Unwin in black at tail, both over a field of orange. Allen and Unwin added a page of ads for their other books at the end of Starrett’s text. Except for the British publisher’s information, a page of advertisements at the end and similar details, the British edition is very much like its American cousin of 1960. In fact, it appears Unwin and Allen used the same plates to print the text that were used in the States. I wonder what the author had to say about that? Long before I picked up a copy of this edition, I was familiar with Allen and Unwin. While still a college student, I had picked up a second-hand, late edition copy of J.R.R. Tolkein’s The Hobbit, published by Allen and Unwin. It pleased me to think that my two fascinations had this one publisher in common. If you want to know more about these two fine folks, you should pick up Mattias Bostrom’s delightful From Holmes to Sherlock. My point in raising their names is to briefly look at their two books in relationship to Private Life. Holroyd, who was chairman of the Sherlock Holmes Society of London at the time Private Life was published, does not offer such a direct link to Starrett as does Brend. But, a review of the chapters in Holroyd’s book shows a strong similarity to Private Life. Sounds like a summary of Private Life, wouldn’t you say? U.G.L.Y. You ain’t got no alibi.